● The Only Custom fit Rubber Mat for all vehicles. ● Over 6000 custom designed patterns. ● Fit for passenger areas, cargos, trunks, decks, and virtually all floor surfaces. ● Many one-piece wall to wall and over-the-hump patterns. • Extremely complete protective coverage. • Coverage for areas not available from other tray and liner products. ● Heavy composition rubber stays flexible in sub freezing conditions. ● Unique round well design for easy cleaning. ● Clean with spray from hose. ● Larger “wells” provide double the capacity than previous design. ● Contemporary edge-to-edge material design. ● Non-Skid Nib backing keeps mats in place. Increased number redesigned nibs. ● Black, Grey, Tan, or Crystal Clear colors to choose from. ● No raised edge to hinder entry and exit from vehicle. factory installed hook, snap, post, etc. ● Five-year materials and workmanship warranty. 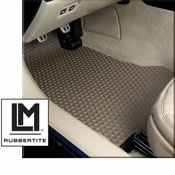 Rubbertite Mats should not be placed over other floor mats. Rubbertite Mats are designed as a stand alone mat item. Rubbertite Mats are equipped with anchoring devices to keep them securely in place. These devices may not work properly if Rubbertite Mats are used over another accessory floor mat.